Dolutegravir, which enjoys a reputation as the best of 32 marketed antiretroviral drugs, took a serious hit in May when a preliminary analysis from a study that included more than 10,000 HIV-infected pregnant women in Botswana revealed it may lead to serious birth defects. Today, at the International AIDS Conference in Amsterdam, researchers reported more data from that study that suggest the risk of harm may be lower than first thought. But troubling questions remain about its safety during pregnancy and whether programs that plan to promote it widely should restrict its use in women of child-bearing age. The potential problem with dolutegravir surfaced because of worries about another anti-HIV drug, efavirenz, which caused what are known as neural tube defects in newborn monkeys. 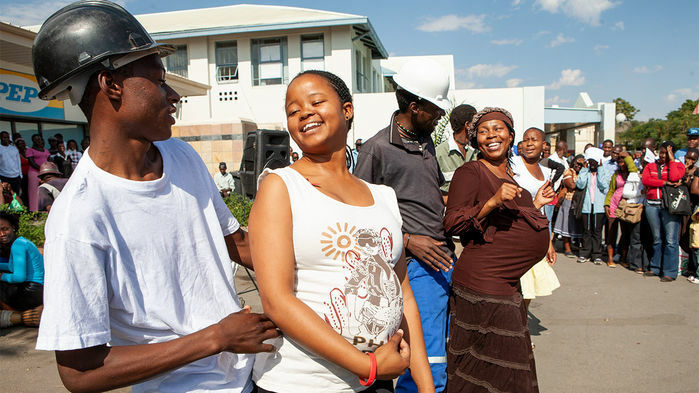 In 2014, researchers in Botswana began a 4-year surveillance study, called Tsepamo, of all babies born to both HIV-infected and uninfected mothers at eight clinics to assess the frequency of neural defects. This rare condition can cause large holes in the spine or can prevent the top of the skull from forming. Two years later, before those results were in, Botswana made dolutegravir a preferred treatment because it powerfully suppresses HIV, people tolerate it well, and drug resistance rarely surfaces. On 18 May, WHO issued an “alert” warning about the potential danger. Many countries had planned this year to start using dolutegravir—which is available in a cheap generic combination with other drugs—but these findings hit the pause button on what was going to be a global promotion of the drug. In an unusual sequence of events, The New England Journal of Medicine ( NEJM ) today published the May data in an online report, a few hours before Zash presented an update that goes through last week. As the NEJM paper explains, their initial analysis was of 89,064 births. About 75% of the babies studied were born to mothers uninfected with HIV. There were 86 neural tube defects in all, a rate of 0.1% of the births. In HIV-infected mothers, 14 occurred in women who were taking antiretrovirals other than dolutegravir, a rate of 0.12%. But in 426 women who took dolutegravir before conception, the researchers found four cases of neural defects—a rate of 0.94%, about nine times higher than the other groups. No cases were found in pregnant women who started the drug during pregnancy. Neural tube formation occurs during the first 28 days of pregnancy. Pediatrician Lynne Mofenson, who works with the Elizabeth Glaser Pediatric AIDS Foundation in Washington, D.C., chaired the session and gave an overview of neural tube defects and antiretrovirals. “We have no antiretroviral regimens that are completely safe,” she stressed. “It’s a matter of benefit versus risk.” And for dolutegravir, that equation is tricky because the drug works exceptionally well at suppressing the virus for long periods, clearly benefitting the mother. “Many times I feel like we’re in a maternal-baby boxing match and we’re pitting one against the other,” Mofenson says.